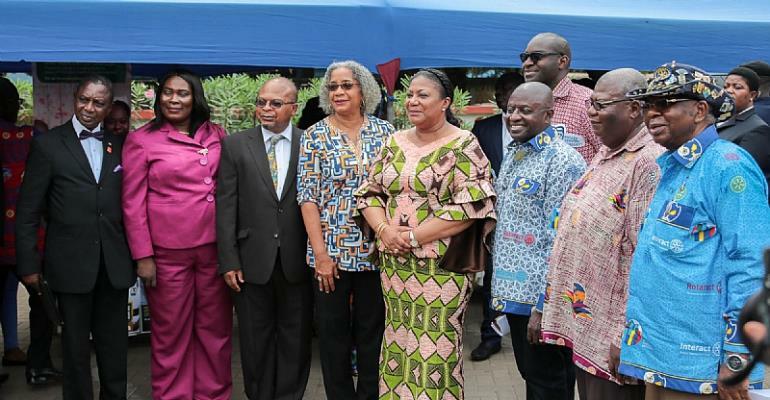 On February 20, 2018, the First Lady of Ghana, Mrs. Rebecca Akufo–Addo; representatives from the Ministry of Health; representatives from Rotary International; and USAID/Ghana Mission Director, Sharon L. Cromer, participated in the national launch of Rotary Family Health Days at Osu Ebenezer Presbyterian Church in Accra. Since 2014, Ghana’s Rotary Clubs held Rotary Family Health Days, in partnership with governmental and non-governmental organizations, to provide health screening services to vulnerable children, women, and men in the urban and peri-urban areas, benefitting more than 119,000 clients. This year’s event, entitled “Healthy Families, Healthy Communities,” is scheduled for February 20-24, 2018. Fifty communities located in the Volta, Central, Ashanti, Western, Eastern, Brong Ahafo, Northern, and Greater Accra Regions will benefit from targeted outreach activities. Community members will receive condoms; HIV counseling and testing; family planning education; screenings for tuberculosis and diabetes; blood pressure checks; childhood vaccinations and vitamin A supplements; deworming; and eye health testing. USAID/Ghana, through its implementing partners, will support the Rotary Family Health Days with logistics, commodities, and communications.